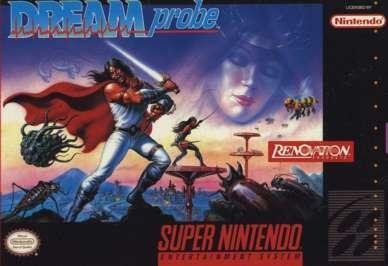 Dream Probe was planned for release sometime in 1993-1994. This was another Telenet game that was being planned for release in the US. This game is a side-scrolling action game featuring a main character with a sword-like weapon. Like other Renovation games, it was likely not released due to the fact that Renovation was bought by Sega. The February 1993 issue of Nintendo Power mentioned this game. The January 1994 issue of Nintendo Power lists it as having a release during September 1993, though obviously this is incorrect.